Hours later, a second man ascended the building -- a stunt that drew the attention of thousands of onlookers, along with TV cameras that captured the drama in real time. The climber making his way up the building Thursday evening could not immediately be identified, police said. 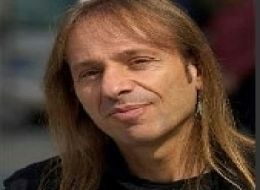 Alain Robert, also known as the 'French Spiderman,' decided to climb 52 stories of the New York Times building on Thursday before being arrested by the NYPD upon reaching the summit. Robert, who is known to scale high-rises to draw attention to environmental issues, did this particular climb untethered. Upon reaching the top he unfurled a banner that read "Global warming kills more people than 9/11 every week." 46-year-old stuntman famous for scaling structures like the National Bank of Abu Dhabi, the Sydney Opera House in Australia and the Eiffel Tower and Montparnasse Tower in Paris. He wore a T-shirt with his name and the address of a Web site (thesolutionissimple.org), exercise pants and climbing shoes. He had long blond hair. 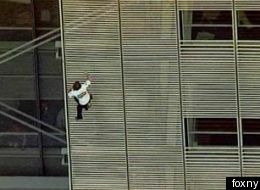 Pictures of Robert climbing the Times building. Watch video of him in action.